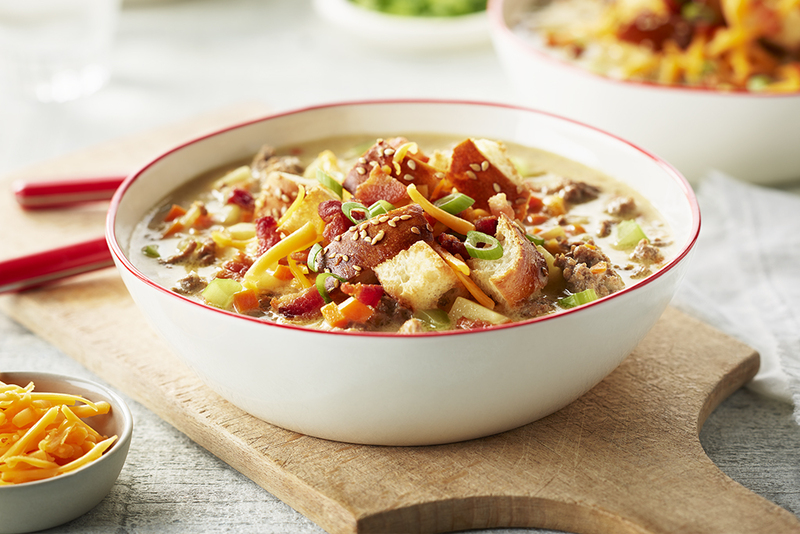 All the flavour of a cheeseburger is packed into this easy, everyday soup that’s sure to become a new family favourite. Spread bun cubes in a single layer on a baking sheet. Place into oven and bake until crisp and golden, about 10 minutes; set aside. Drain all but 1 tbsp (15 mL) of the fat from the pan and return to medium high heat. Add ground beef and cook until browned, about 3-5 minutes, crumbling the beef as it cooks; drain excess fat and set aside. In large saucepan over medium heat, melt butter. Add onion, celery, carrots and cook until tender crisp, about 4 minutes. Add garlic and Worcestershire sauce ; cook one minute more. Whisk in flour until lightly browned, about 1 minute. Gradually whisk in beef broth and cream, and cook, whisking constantly, until slightly thickened, about 1-2 minutes. Stir in bay leaves potatoes. Bring to a boil; reduce heat and simmer until potatoes are tender, about 12-15 minutes. Stir in ground beef, cheese, salt and pepper, to taste. 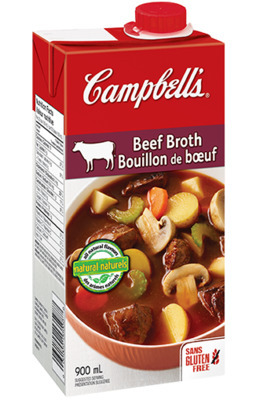 Serve immediately, garnished with croutons (bun cubes), bacon and green onions. Top with additional grated cheddar and hot sauce if desired. This recipe was one of my least favourite of all. When you have hamburger, bacon and cheese you add tomatoes. Definitely not potatoes, celery, carrots. Absolutely yummy. I left the soup simmering for an extra 30 minutes.